The starting point for the investigation was the discovery, between 1979 and 1986, of several thousand textile fragments, as well as a number of textile-related objects, during excavations at the Workmen's Village at Amarna. Although they derive from the circumscribed social context of an isolated and specialized community, they belong nonetheless to the key category of what was in everyday use and deserve to be valued accordingly. The project came to an end in 2001, with the publication of a monograph on the work (described below), and the completion of a database containing details of individual textile fragments (also available for download below). Fragment of linen in basket weave with looped threads of vegetable fibre from the Workmen’s Village. No. 3175. 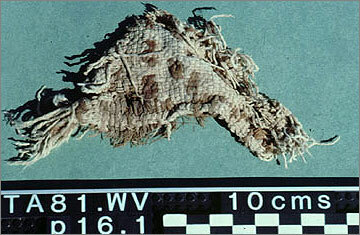 The cleaning, examination and recording of the textiles were carried out by Gillian Vogelsang-Eastwood during two field seasons at Amarna, in 1984 and 1987. The second season allowed the cataloguing of the Workmen's Village textiles to be completed following the cessation of excavation there in 1986. By then a preliminary report had already been published (Eastwood, in Amarna Reports II: Chapter 10). The field recording initially took two forms: a series of working notes from which a draft text was composed, which described the textiles and put them into the context of the ancient Egyptian textile industry, and a numerical database which recorded the attributes of each of the 4962 numbered specimens. This material was passed to Barry Kemp for editing and further development, including utilization of the database. In April 1996 Kemp also checked certain elements in the catalogue together with the text against the original specimens at Amarna, made further identifications, and selected a range of examples for photography by Gwilym Owen in the studio at the Egypt Exploration Society's field station at Amarna. The majority of the textiles are stored in small plastic envelopes and bags in groups of one hundred in large thin polythene sacks, and these in turn are laid in rigid self-stacking plastic crates. They now occupy a run of shelves in the site magazine at the expedition field station. This is a large high-ceilinged building of limestone walls and concrete roof which is kept sealed for most of the year but is provided with ventilation shafts and a powerful extractor fan. It is cool throughout the year and the humidity level is not high. The storage of the textiles in plastic bags is not wholly satisfactory, but, in the circumstances, this has proved to be the only practicable method for the majority of the fragments. Over a period of ten years, during which time they have been checked, no change in their condition has been observed. Specially selected and treated specimens number around 190, approximately 4% of the whole collection. Each one has been placed between sheets of acid-free tissue paper to form an envelope. Related groups have then been laid in a folder made from white blotting-paper, and several of these together placed on a series of shallow wooden trays and also stored in the magazine. Some of the fragments of sleeve, however, were stored separately on pieces of nylon net and then placed on the same shelf as the folders. 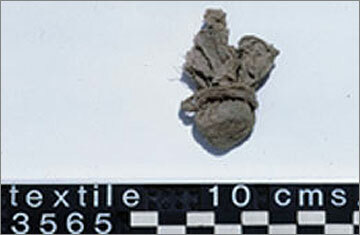 The textile fragments have not been included in the official register of antiquities, and since the current policy of the EAO (now Supreme Council of Antiquities) is that no object, textiles included, should be removed from the site unless for study at a scientific institution, normally within Egypt, it is to be presumed that they will remain indefinitely as a single reference collection in the site magazine. A piece of cloth pushed from its centre to form a little pouch, the ‘neck’ then tied with a piece of string. On opening, it was found that one corner of the cloth had been tucked inside, and bore traces of an unknown brown substance. No. 3565. Although when compared to the major collections of Egyptian textiles in museums the individual pieces are unimpressive, like any set of specimens from a modern archaeological excavation it is only right and proper to present them as they are, partly as database and partly as illustrated examples which, together, will form a reasonably objective record of what was found. The small size and often degraded state of the textiles does have some merit, too. They make it easier to concentrate on fine details of construction, and often, in the process of coming apart, they reveal how they had been put together. Part I of the monograph (Chapters 1-6) is an illustrated description of the material and a discussion of spinning and weaving processes. The clothes that were worn and the role of textiles in Egyptian society at any period are certainly subjects worthy of continuing investigation. For the individual they were markers of status and collectively they helped to define Egyptianness. These aspects have passed into modern reconstructions of Egyptian life, in films and in graphic art. The clothes that the ancient Egyptians are given are a cultural uniform that is instantly recognizable. The source material used by costume historians and artists alike has been the scenes and statues created by ancient Egyptian artists. The actual textiles found in Egypt, however, suggest that the results of relying upon the artistic sources are misleading. Excavated finds, and a more sympathetic reading of some of the written sources, give a rather different picture and leave one feeling that, could one but see an ancient Egyptian street scene, it might not tally too well with common preconceptions. In general it is likely that the Egyptians would have appeared more heavily dressed, in swathed lengths of plain linen, in a style which has survived, for example, in Eritrea. There is much scope for exploring and reconstructing anew how the ancient Egyptian really dressed. Included in the study (Chapter 6) are a few tentative sketches, which are needed not just for visualizing better the nature of the highly fragmentary material in theAmarna collection, but also as a means of clarifying what was the basic output of the large-scale textile industry which, for the New Kingdom, is a relatively well documented part of the economy, widely pursued at Amarna. The conclusions reached are somewhat at variance with the current consensus. Part of one side of a triangular loin cloth. No. 4476.1. The study of the textile pieces provided the impetus for an investigation which has broadened in scope as it has developed to take in textile manufacture in the city of Amarna as a whole. This shifted the focus from textile specimens to artefacts which might have been used in spinning and weaving, and to how the latter were distributed, with a view to understanding better the scale and location of the textile industry in the city. The intention to create for Amarna a series of distribution maps of artefacts of known use can only be accomplished by reference to the huge amount of material extracted but never properly digested by previous expeditions, namely those of W.M. Flinders Petrie in 1891-2 (who recorded, however, very few provenances for small finds), of L. Borchardt and the Deutsche Orient-Gesellschaft between 1907 and 1914, and those of the EES during the 1920s and 1930s. None of the expeditions managed to publish a fully illustrated and comprehensive list of artefacts found, and it has not proved possible to search out more than a selection of the objects themselves and to document them afresh. What has been done, as a compromise, is to utilize, where appropriate, the original documentation of the old EES expeditions now in the EES archives, and also to add material gathered by the current expedition over the last few years. In the case of Borchardt's excavations, by good fortune most of his finds were subsequently kept together and are now housed in the Berlin museums. A preliminary study was made of the relevant pieces during three visits by Kemp and Owen in 1995/6. Chapters 8 and 9 present the archaeological evidence for spinning and weaving across the various sectors of the city. Our attempts to understand better the practical consequences of ideas first developed on paper also led inexorably to the making of a working reconstruction of a New Kingdom loom of the type shown in the art of the period, a full account of which is given in Chapter 10. The idea came quite late in the preparation of the volume. It would have remained only an idea but for the enthusiasm and ingenuity of Herbert G. Farbrother, OBE, of Over, Cambridgeshire, formerly of the Cotton Research Corporation and, since 1981, a maker of unconventional spinning and weaving equipment, and a member of the Cambridgeshire Guild of Weavers, Spinners and Dyers, assisted by Joyce Farbrother, a professional spinner and weaver, with whom Kemp was put in contact by Gwilym Owen and Heidi Lichterman, President of the Cambridgeshire Guild. In the later stages, several completed experimental versions of the vertical loom served our discussions as enormously useful teaching aids, and also drew some criticism from professional weavers with an interest in history on the grounds that the reconstruction was too elaborate. This prompted some thoughts on the history of technology in ancient Egypt which are pursued in Chapter 9. A final Chapter 11 attempts to put the textile industry of Amarna into the context of New Kingdom society. 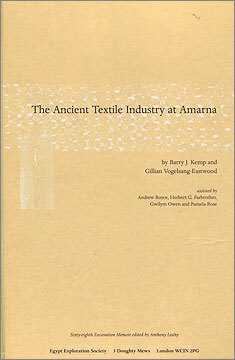 The Ancient Textile Industry at Amarna, by Barry J. Kemp and Gillian Vogelsang-Eastwood, assisted by Andrew Boyce, Herbert G. Farbrother, Gwilym Owen and Pamela Rose. Sixty-eighth Excavation Memoir edited by Anthony Leahy. London, Egypt Exploration Society, 2001. 498 pp. Numerous illustrations and tables. The total number of entries in the database is 4962. It contains, however, a number of entries which are superfluous to analyses of the textile collection of the Amarna Period. Because all linen- and wool-based items were recorded many pieces are actually lengths of thread and string. Some had been left as such, some were the result of a piece of textile coming apart, others were plaited and derived mostly from fringes. A separate study of cordage and basketry was subsequently undertaken by Willemina Wendrich, and a full treatment of string and rope will appear in time in the published version. Some basic information on linen cordage is nevertheless presented in Chapter 3, on spinning, but this information needs to be kept separate from that on woven textiles. Then there are a small number of pieces which are almost certainly later than the pharaonic period but were inadvertently included and need to be ignored when the collection is analysed. Finally, as the cataloguing proceeded, many fragments were identified as having come from the same textile but were, all the same, given a separate catalogue number. These duplicates, too, need to be weeded out when simple statistical summaries are attempted on the textiles of the Amarna Period. Consequently an additional column (headed N/t for 'not textile') was added between the main set and that for 'comments'. It contains a numerical coding for 'comments' initially created when the recording for the database began and subsequently modified as the work progressed. The analyses included in the study are based not on the full set of 4962 entries but on a reduced version of the database which omitted specimens which contained entries in this column and comprised 3687 items. There are, in addition, small groups of textiles which have remained separate from the main catalogued set. Although some have been used to illustrate certain topics they do not form part of the database. In the case of a small group of specimens which went to Cambridge as part of radiocarbon dating material (Section 1.7), a separate number was given to each with the prefix 'Amar.' Four of them appear in the database. A group of eleven lamp wicks which have remained at Amarna but were analysed separately for their resin content (Section 6.15, Table 6.7, pp. 244-5) formed part of a separate catalogue of resinous material made by M. Serpico. Each has the prefix AM. In a late session of checking the material in store a few extra pieces of textile were found which provide useful additional illustrations. Six of them appear in the text and in the catalogue as <no no.> followed by their excavation context number. The database contains 24 columns, which describe the specimens in the following way. A Textile number. A running series of catalogue numbers. In the published text each number is written in angular brackets, thus <1490>. C Grid. Two five-metre grids of excavation squares were used at the Workmen's Village, numbered 4 for the main grid of the Workmen's Village, and 5 for Site X1, see Figures 7.1 and 7.2 in the book. D Square. The five-metre grid square in which the specimen was found, e.g. L17. The houses inside the walled village are identified both by the principal square which they occupy in Grid 4 and by an abbreviation for the street designation created in City of Akhenaten I. Thus the house Long Wall Street 5 appears as F25 (LWS5). E Level/unit. Between 1979 and 1982 each stratigraphic layer in a five-metre square was given a number, starting from 1 each time. These numbers were written in round brackets, thus (1). In the database, however, the brackets have been omitted. Occasionally small features were given a number in a triangle, written in angular brackets in the database, thus <5>. Since 1983 all stratigraphic layers and features have been numbered in a single continuous series of 'units', written in square brackets, thus . G Fibre. The initial identification of all fibres in the Workmen's Village textiles was based on visual appearance of the thread. This was later confirmed by microscopic examination and by comparison with modern examples of known fibre types. For the initial cataloguing, eight categories were devised: flax (1), cotton (2), bast (3), unidentified vegetable (4), wool (5), goat hair (6), unidentified hair (7), and unidentified fur (8), to which unidentified general (9) was added. 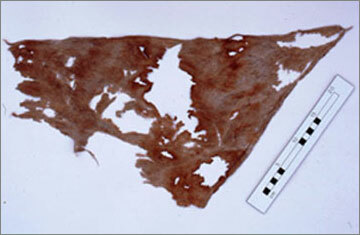 The identifications of some of the samples of goat and wool were subsequently confirmed by W.D. Cooke (Section 6.17). The unidentified classes (4, 7, 8, and 9) were represented by only modest numbers of specimens: respectively 34, 16, nil, and 4 of the complete set (thus 1.09%); and 8, 7, nil, and 1 of the reduced set (thus 0.43%). The criteria for these groupings are not well defined and there is a case for reducing them to a single 'unidentified' category, but, in the end, nothing is lost by keeping them, as long as it is realised that they are only provisional classifications. See Chapter 2. I Tightness. Three measures of tightness of the spin were recognized: 1: t/t (tight); 2: m/m; (medium); 3: l/l (loose). See Figures 3.8, 3.9a. J Diameter of thread or yard. The following measures were used: 1: very fine (less than 0.2 mm); 2: fine (0.2-0.3 mm); 3: medium (0.4-0.6 mm); 4: coarse (0.6-0.9 mm); 5: very coarse (greater than 0.9 mm). See Figure 3.9b. This element of the recording was only done in the 1984 recording (which ended at no. 3999). K Weave. The following types of weave were recognized: 1: tabby; 2: warp-faced tabby; 3: half-basket, with paired warps; 4: full basket; 5: half-basket, with paired wefts; 6: warp-faced half-basket with paired warps; (7: netting/knotting); 8: weft-faced tabby; 9: warp-faced half-basket with paired wefts; 10: warp-faced basket. When grouped together tabby weaves comprise types 1, 2, and 8; basket weaves types 4 and 10; and half-basket weaves types 3, 5, 6, and 9. See Section 4.2 and Figures 4.7a-d.
L Looseness or closeness of weave. The following codes were used: 1: loose; 2: very loose; 3: close; 4: very close. This element of the recording was only done in the 1984 recording (which ended at no. 3999). M Edge. A piece of cloth taken from a loom has four edges, comprising the two sides (selvedges) and the two transverse edges (the top and the bottom) where the weaving was started and finished. Two of the sides, namely one of the selvedges and the finishing border, were frequently provided with a fringe which was also the principal form of textile decoration in ancient Egypt. Columns M and N provide spaces for recording one or two of these elements when preserved on a fragment, using the following codes: 2: starting-border; 3: selvedge (with 3.1 for 'simple' and 3.2 for 'warp-faced'); 4: weft fringe; 5: warp fringe; 8: uncertain nature. These aspects are described and illustrated in Chapter 4. O Modification 1. The following codes were used to record modifications done after the cloth was removed from the loom: 2.1Ð for hems, using a typology illustrated in Figure 6.7; 3.1Ð for seams, using a typology illustrated in Figure 6.7; 5 for loops or pile (with 5.1 for cut and 5.2 for uncut; see Chapter 5). In addition a few entries using the code 4 refer to weaving faults. Q C/wp (warp count). The character of the weave is affected by the relative density of the warp and weft yarns, as well as the thickness of the yarns themselves. The combination of these aspects largely defines the quality of a piece of cloth. The textile catalogue lists for each piece, where it is feasible to do so, the number of yarns per cm in both warp (C/wp) and weft (C/wf) directions. (Although where the loosening of the weave seemed to have affected the whole piece, the entry 'deteriorated' was put in the comments column.) Figure 4.11 is a plot of this information for the Workmen's Village textiles (based on the reduced set). It should be borne in mind that one effect of deterioration is for the weave to loosen, so that in some specimens the count for warp and weft might be less than when they were first woven. R C/wf (weft count). See previous note. S S/wp (size in the warp direction). The size of the specimen, measured in centimetres to the maximum extent of the warp (insofar as it can be distinguished from the weft). T S/wf (size in weft direction). See previous note. U Sample. Identifies those specimens from which Vogelsang-Eastwood removed samples for further analysis. W Comments. One of the comments covers 'self-bands' which could have been given a numerical entry. The difficulty with dealing with them consistently is that they sometimes formed part of the strengthening of a warp fringe. The comments column also serves to identify specimens which were thought to be from a common original piece of cloth. Within these groups only one specimen was selected for full recording and this is labelled 'ref. specimen' (i.e. reference specimen). X References. An index of page, illustration and tabular references to the individual specimens within the book The ancient textile industry at Amarna.